Apple has finally shipped watchOS 3, the third major version of their still extremely young wearable platform. 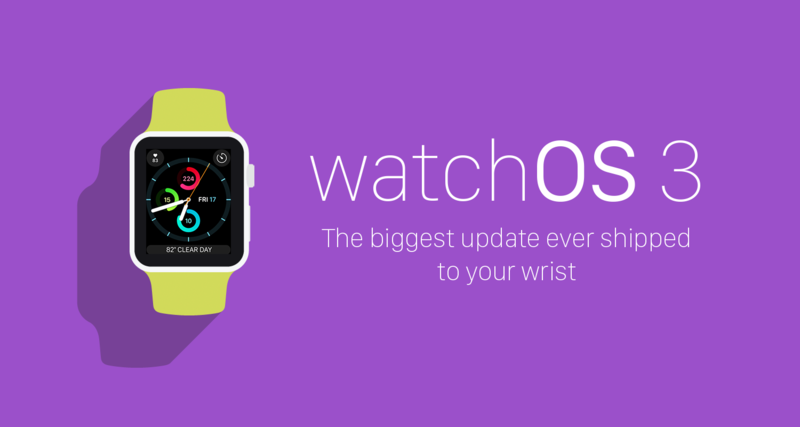 watchOS shipped in April 2015, with watchOS 2 coming just a few months later in September. As I have made very clear with this site, I have owned an Apple Watch since launch day last April and have worn mine literally every day since then. I have a profound love for my Apple Watch, and can’t see going back to a world without it. Keep that in mind when reading this review. I am not a watch hater who has suddenly been won over by this miracle of a release from Apple. I’ve been a fan since the start, and while I’ve had harsh criticisms of the device, it’s always been from a place of concern, not disdain. As I’ll lay out throughout this piece watchOS 3 does a lot to fix many of the things that were wrong with watchOS 2, but it does not fundamentally change how the device works. You also will not hear me saying “this is the version of watchOS Apple should have shipped from the start.” This is a reductive statement, and one that so wildly ignorant of the way that software is developed and grows up over time. The changes Apple has made to watchOS in the past year are based on user feedback. Apple could not have made this version of watchOS without creating the previous version and getting that feedback from millions of real world users. There’s a lot to love about watchOS 3, and I really do think it is the best, most substantial update Apple is shipping this fall. iOS 10 is fantastic, tvOS is solid, and macOS is frankly pretty mild, but it is watchOS that stands high above all of those platforms and has improved immensely since just 12 months ago. This update does the impossible in making your old hardware feel brand new. watchOS 3 has breathed new life into the original Apple Watch hardware, now endearingly referred to as “Series 0.” This is what I thought the second generation Apple Watch would feel like to use, and Apple has managed to get me that feeling in the same old hardware that’s been around for a year and a half. I always assumed I would be chomping at the bit for an Apple Watch 2, but outside of GPS and a few other niceties, I don’t think anyone will feel bad about keeping their original Apple Watch for at least another year. Below I have laid out the particular features that have either been added or enhanced in watchOS 3 that I feel have had the most impact on my day-to-day usage of the Apple Watch. It’s not a full overview of every single little thing added or changed, but rest assured because I’m sure there will be people creating that sort of review. Nor will I be able to address specific third party apps that are being updated to take advantage of some of the new APIs made available in watchOS 3; I simply have not been able to get on enough betas this summer to report on those updates. Rest assured I’ll be keeping up with these developments and will have follow up pieces in the coming days as these updates roll out. I hope you enjoy the review! If you do, let me know on Twitter. Even better, share it on your social network of choice! I wanted to kick off with the little things about watchOS 3 before diving deep into the major new features. If you don’t care about the little things, feel free to skip right over to the next section. First off, I have to talk about the change in media controls in watchOS 3. You used to pull up from the bottom of the watch face to bring up your glances, and one of the glances was your media controls. Since glances are dead, that’s not how it works anymore. Now the media controls have been moved into their own app called Now Playing. Now Playing is in your Dock by default, and initially is a frustrating change. Your muscle memory needs to change as you no longer swipe up on the home screen, but press the side button from anywhere and slide over to the app. I no longer think Apple’s implementation is bad, but I think it should be a little quicker and more intuitive than it is. Speaking of Control Center, I think this is a nice consolidation of a few screens down to one easy view and is a total win. I wish it had media controls, but otherwise it’s aces. The new wheelchair features are really special, and something that Apple certainly did not need to do. It’s not a feature that is likely going to drive up sales of a Apple Watch in any meaningful way, but it will be hugely beneficial to those who need it. There are a bunch of new watch faces, ranging from activity-based faces that put your activity stats front and center, over to another new one named Numerals that scratches my minimalist side very nicely. I find the activity-based faces to be a little busy for my taste, but if you’re treating your Apple Watch like a fitness tracker, these may be perfect for you. Then there have been updates to some of the existing faces. Mickey Mouse has been updated to include a Minnie variant. X-LARGE now lets you include a single oversized complication on your watch face, and the Timelapse, Photo, and Motion also support a few complications each. Despite these new watch faces and refinements to old ones, I think it’s ridiculous that Apple is not allowing third party developers to create their own watch faces. It’s Apple’s “most personal device ever” but your watch face is never going to be totally unique. This feels a lot like the iPhone wallpaper issue from the early days of iOS. Apple didn’t allow you to set a wallpaper for the first 3 versions of iOS, and then iOS 4 opened the floodgates to allow you to set anything as a wallpaper. I sincerely hope Apple brings this functionality to next year’s release. One more thing about watch faces: I really want Apple to bring always-on watch faces to watchOS ASAP. Android Wear has this a a pretty standard feature at this point, and while my Apple Watch does a pretty good job of turning on every time I turn my wrist, it would be so nice to have it be 100% because the face is always showing information. It’s probably a battery issue and we’ll have to upgrade to the Apple Watch Series 3 next year, but I’ll be over the moon with excitement when that happens. And this section wouldn’t be complete without mentioning the updated Watch app for iOS 10 that allows you to do more than ever from the phone. The biggest change is that you can now set up and edit your watch faces from the phone app. I still find it more convenient to do them on the watch itself, but having the option to do it from the phone has occasionally been a plus. If nothing else, it gives you a way to choose your color and complications on a larger display, which can be good for some people. Talk to any Apple Watch owner and ask them what their number one complaint is, and I would expect you would get the same answer from almost everyone: it’s just too slow. Everything from launching apps to performing actions in those apps is just painfully slow much of the time. When we talk about the reasons for the Apple Watch to exist, one of the big reasons is that it’s supposed to do some things easier and faster than on the iPhone. When it’s slower than the phone, it doesn’t matter how easy it is, so speed had to be a primary focus for Apple with watchOS 3. Thankfully it appears this was their top priority. In wonderful Apple form, they are willing to trash their old and busted software to make sure you understand just how damn good the new stuff is. There was some rumbling after the keynote that apps certainly won’t be as fast as they were in this presentation, but I’m happy to report that my experience has been just as impressive almost all the time. The Apple Watch hardware is exactly the same as it was 17 months ago when watchOS 1.0 was released, so how did Apple get all this extra speed without throwing any more power at it? As Apple describes it, they had overcompensated for battery life, so they held back the hardware in earlier versions of watchOS so as not to strain the battery. They overcompensated and the battery on the Apple Watch lasts well over 24 hours for the vast majority of people. Now that they have some more real world data for how people use the watch and what their battery percentage is when they take it off at night, they have decided they can take advantage of more power that was already there in the first place. How they do this is not usually important, but you should know what’s going on behind the scenes so you can take advantage of these performance gains. First, Apple is keeping what they describe as “your favorite apps” in memory so that they are not launching fresh every time you want to use them. Apple says “your favorite apps” which translates specifically to the apps you have as complications on your watch face, as well as all apps you keep in the all new Dock. You can keep up to 10 apps in the Dock and a maximum of 5 apps on your watch face, so up to 15 apps can be constantly stored in memory. That’s not every app on your watch, but it’s probably more apps than you use on a regular basis. I’ve maxed things out, and as surprising as it seems watchOS 3 does seem to be able to keep up with all of this. Each app really does launch instantly. This is also a good time to note that your apps do not need to be updated to watchOS 3 to take advantage of this always-on feature. As long as an app has been updated for watchOS 2 (and the vast majority have), then it can run all day in watchOS 3 and behave as you would expect. See The Dock section below for how this is an issue in some apps. The second part of the speedier performance in watchOS 3 is background updates. This is something that developers do need to update their apps to take advantage of, but this will allow apps to update themselves in the background so that you will theoretically always see current information when you open an app. This will be most useful for apps that have data changing more often than average. The ESPN app for example, will be able to use this to update scores at a much more rapid pace than they could on watchOS 2. So if you ever pulled up a game’s score and said “yay, my team is winning!” only to see the scores update a few seconds later and realize “oh no, they’re actually losing!” you don’t have to ride that emotional roller coaster again. Even apps that update less frequently will benefit from this and make the experience of using watch apps just a little nicer. My weather app of choice, CARROT Weather, is able to use watchOS 2 capabilities to have its watch face complication update every hour so my weather forecast is usually up to date, but it has a fundamental problem when you launch the app itself. Instead of immediately showing me the current conditions, it shows me what the conditions were the last time I launched the app…which could be days ago. Since watchOS 2 is pretty slow, it takes a good 10–15 seconds sometimes to have the screen refresh and show me the current conditions. With watchOS 3, CARROT Weather is able to update itself in the background so that I always get the current weather conditions, and not something old and misleading. When it comes down to it, Apple could have delivered nothing but these improvements to performance and I would be relatively happy with the end result. By addressing the most basic issue with the original Apple Watch, they have made everything that you do on the watch better. I talked last year about how a good wireless router just makes all the tech in your home feel better because suddenly all your devices are faster and more reliable. The same can be said for adding some serious speed to the Apple Watch. The things you’re doing aren’t dramatically different, but being able to do them in so much less time makes them infinitely more useful. Apple has also just announced the new Apple Watch Series 1 & 2, which sport about 50% more power than the original Apple Watch. While I have not been able to test these new models yet, I feel pretty confident everything I just said will be doubly true for those new models. But again, the speed improvements are impressive even if you don’t buy a new Apple Watch, so don’t feel like you have to get one to take advantage of all this new stuff. The single biggest innovation to all of watchOS in this release is the dock. This feature is a brilliant addition to the watchOS interface, as it allows you to make your watch experience incredibly fast for whatever you personally need it to do. As addressed in the previous section, performance was a big focus for the watchOS team in this release, and the dock is where you can put the apps you want to benefit most from this speed upgrade. What makes this feature so smart on Apple’s part is in how it takes something we know about the Apple Watch (that people tend to use it for just a few things) and introduces a very clever way to make those things faster with underpowered hardware. They could not make every app launch instantly, but they let you pick the apps that you want to do that so it feels like everything you actually use does. The concept is simple: apps that you put in your dock will always be running in the background, so when you tap them, they’re ready to go immediately. It’s not that they are launching quickly, it’s just that they’re never not running. So when you tap the app you want to use it’s not launching that from scratch, it’s just coming to the front of the display. It’s a technicality, but it’s a pretty damn important one. With this set of apps, my Apple Watch is suddenly the fastest way to start a workout, send a message, mark a todo item complete, or find where my wife is at the moment. These are the things I need my watch to do most often, and I can’t stress this enough, but they are now super fast. I have my iPhone install every single Apple Watch app on my phone for apps that have them. This means my honeycomb launcher on the watch is a complete mess of every app known to god. I don’t use most of those apps, but I like to have them there anyway. In day-to-day usage, I really only use a handful of apps, but now that I have the dock (and complications), the apps that I actually use are zippy. It’s not a big deal that my Tweetbot app loads just as slowly as it did on watchOS 2 because I simply don’t use it. This new focus on making the things you actually use your Apple Watch for is a wonderful step in the right direction for the platform. Not all is sunshine and rainbows when it comes to this new app loading hierarchy, though. While the apps that reside in your dock are now speed demons, all your other apps are at best just as slow as before, and at worst actually slower than they ever have been. On those occasions where you want to use an app that’s not in your dock, that app is going to spin and spin and finally load after a few seconds, just like it did on the old watchOS. Apple didn’t perform any real magic here; the Apple Watch hardware is still insufficient to dynamically bring you to any app in the blink of an eye. All is not perfect for your docked apps either. Apps are starting to be updated with watchOS 3 functionality, but any watch app built for watchOS 2 can take advantage of the dock’s always running functionality. This is fantastic because you don’t need to wait for your favorite app’s developer to push out an update that adds this functionality, it’s just there by default. On the other hand, it’s a bit of a problem for non-updated apps that don’t understand that they could be running for more than a few minutes at a time. For example, I put the Strava app in my dock almost immediately because I hated how long that app took to load when I was trying to start a run. This was all well and good (the app did indeed launch very quickly), but since Strava was built under the assumption that it would only be running when the user was doing a workout, it got a little aggressive with the performance and these two things combined to both an iPhone and Apple Watch that were just hemorrhaging battery. It makes total sense for Strava to activate these things if you know that the user is only going to be opening you if they want to use you right now, but they fall apart when you can just run all day whether you’re used or not. I had to take Strava out of my dock and resign itself to the general app honeycomb of sadness™ where it still takes too long to load. Presumably Strava will get an update out that addresses this, and then this will go straight back into my dock. Has Apple been doing this all along? My suspicion is that Apple has always been doing something like this in watchOS right from the start. You noticed that built-in apps like Timer and Stopwatch would reliably load faster than any third party app on the device. I used to think this was because those apps were just leaner and faster than anything else, but now I actually think Apple had those apps loaded in memory at all times so they could come up quickly. The dead giveaway is that Stopwatch, an app I rarely use and don’t have in my dock or on a complication, is much slower to load in watchOS 3 than it was last year. This app that used to be open nearly instantaneously is now a 5-ish second wait every time I try to use it. For comparison the Timer app, which I use much more frequently and is on my watch face, loads instantly every time. I don’t have any hard proof of this, but it seems that in watchOS 2 Apple had a certain set of their own apps that they had permanently in memory and would load quickly because of that. The big difference in watchOS 3 is that they now give you the power to control what apps are treated this way. The Apple Watch has always felt to me like it’s a communicator out of Star Trek. I wear this damn thing so much that I have a tan line on my wrist (I’ve worn watches my whole life and never had one like this), and also that all my messages, @replies, and tags get delivered straight to my wrist. There’s no device I have to go find that’s receiving this information. There’s not a sheet of glass I have to pull out of my pocket or find somewhere in the house. No, my communication is delivered to me, wherever I happen to be. That’s part of the magic of the Apple Watch to me, and is the reason that I’ve long been a proponent of smart watches in general. What breaks the spell is when I want to reply to one of these incoming messages, I still have to fish out my phone and do the work there to reply. The Apple Watch software has always allowed you to reply to messages from the Watch itself, but it’s been wrought with issues. Thankfully watchOS 3 does a lot to address those issues and bring new options to the table that make messaging on your Apple Watch more feasible. The biggest complication I would run into actually had nothing to do with the software of watchOS, but with the social awkwardness of talking to your devices in public. If I wanted to say anything more than the pre-built suggested responses provided, my only option on watchOS 2 was to dictate my message into the watch. This was a good solution sometimes, but the majority of the time I found myself in a situation where it would be weird to speak my response into my wrist, so I didn’t do it. I’d pull my phone out and type it on the phone like an animal. My Apple Watch was doing a great job of letting me triage my messages as they came in, but it failed at meeting all my needs as a communication device. Apple has addressed this issue with a new input method called “scribble” which allows me to write out sentences with my finger and send them, all without audibly making a peep. In practice, scribble asks you to write out words one letter at a time on screen and it converts that to text. It’s a simple solution to the problem, and stops short of delving into madness and putting a full keyboard on the screen, which Google has not shied away from in their latest Android Wear release. My time with scribble has been almost entirely positive. I know that old school Apple fans had flashbacks to the Newton’s famously bad handwriting recognition when they saw this feature, but we’ve come a long way since then and I find watchOS incredibly accurate in interpreting what I write. Very rarely do I have to backspace and retype something over again. This is great, because if this wasn’t reliable then I wouldn’t use it and I’d just fall back to using my phone to reply to everything. I use this literally every day. iOS 10 brings a good number of effects to iMessage, and somewhat surprisingly, almost all of these features carry over to watchOS. The screen effects and message effects (like confetti and slam effects) will display fully animated on your wrist. They look great and behave exactly as they do on your phone. You are not able to send messages with these effects from the watch, but one would expect this is simply a UI limitation and will be something Apple is trying to figure out going forward. A smaller, but welcome addition is also better support for emoji. We all speak at least partially in emojis now, and watchOS has not been great at supporting this communication. watchOS 3 still has some room to grow here, but they have improved this by moving beyond those weird (creepy?) 3D faces and have made sending regular old emoji much simpler. Now in watchOS 3 when you tap the smily face icon to reply to a message, you get the option to choose from either the creepy 3D emoji or a list of all the regular ones you’re used to using everywhere else in your life. It would be nice if this list was a little easier to navigate, but given the minimal input options of a 1.5 inch screen, this may not be something we can crack any time soon. As I’ve already touched on in the previous sections, speed improvements just make everything better, and Messages improves greatly from this. Messages would load so slowly on watchOS 2 that it was painfully obvious that sending a reply would be faster if done straight from the phone. Now that Messages lives comfortable in my Dock, it takes advantage of watchOS 3’s instant app launching, and it’s precisely 1 million times more useful now that it’s quick. I wrote a long piece back in February where I made my pitch to Apple for what they should be doing with watchOS 3. The pitch was broken into 3 main pillars. The number one pillar in my pitch was “Double Down on Health” and Apple has indeed done just that in watchOS 3. Two big things they actually did were related to adding power to third party workout apps and making the Activity app more social. As a plus, they also now let you tap on this little guy to go back to the workout app you’re using straight from the home screen. That’s a little thing, but man oh man have I been frustrated for the past 18 months that this little guy hasn’t been tappable. Thank you, Apple. Workout is the built in workout-tracking app on the Apple Watch, and it’s a classic example of a bare-bones stock Apple app. It gets the job done, but you’re going to want to use a third party option if you want to have any meaningful options or powerful features. Apple has taken the time to improve this app in watchOS 3 in a few key places, although it still is a little basic for what serious athletes will want. The best change in my view is the new view you get when in the middle of a workout. You used to be able to see just one statistic about your current activity at a time. When I was on a run, I could see either my current pace, my total time, my distance, or my heart rate, but I could not see all of them at that same time. It was frustrating, and Apple has thankfully totally revamped the view you get when working out. Instead of choosing which stat you want to see, you now see everything all at once. It’s still very readable and I’m not confused by all the data on screen when I glance at it mid-stride. This is a 100% slam dunk. Just as a note, you may not like this as much if you actually prefer the old display style. There is no way to go back to the old display method. You get one view, so I hope you like it. UPDATE: Thank you to Mark Miller on Twitter for pointing out that you actually can customize the mid-workout data. You can customize up to 5 stats to show, and can also switch back to the single stat view you had before watchOS 3. You can also change the metrics displayed by workout type, so you really can do whatever you want. This is great, and I don’t know how I missed this in my original review. Another welcome addition is a feature they call Quick Start, which lets you launch into a workout in a single tap. You would previously have to tap on the activity type you wanted to start (walk, run, bike ride, etc. ), set a goal (time, calories burned, etc. ), and then start the workout. It wasn’t bad, but it did create a little friction when starting out on a workout. The Quick Start feature will save the last 2 workout types you did and presents them as options to start with a single tap. These workouts have no goals associated with them, but they’re a super simple way to get into a workout with basically no resistance. Finally, the reporting that comes out of the Workout app is a little more robust than it was before. Most of the stats are exactly the same, but you now get weather information (temperature, conditions, and humidity) for the time of the workout, as well as a map that shows exactly where you went. The map is even color coded so you can see where your fast and slow segments were. Workout is still not an app that will be enough for many athletes, but it’s a step in the right direction. I still wish Apple gave you a way to control your media without leaving the Workout app, and I’d really like to have more interesting achievements laid out to encourage me to go out for a run, but maybe those will come next year. So what if the Workout app isn’t enough for you? What if you want to have all your data synced over multiple devices, you need a more social workout platform, you want some advanced trainer features, and you want the ability to export your data at any time and understand you activity on your own terms? Well then apps like RunKeeper, Strava, and Nike+ come into the picture. These apps were not great in watchOS 1, got a little better in watchOS 2, but they’re finally first class citizens in watchOS 3. This is all great, and most of this was reserved to just Apple’s own Workout app before watchOS 3. You no longer have to choose between using an app that is underpowered but is tightly integrated into the operating system, or an app that has more features, but may not be as reliable due to software limitations. I was sadly not able to beta test any apps from RunKeeper or the like to see these in practice, but the capabilities are there and I would expect to start seeing these apps updated to support the new features of watchOS 3 very soon. I wanted to see this added, but I didn’t think Apple would do it. “Your health data is private, so we won’t let you share even if you want to,” is where I thought they would stand on the issue of social features in Activity, but I was dead wrong. Sharing is it’s own tap in the Activity app on your iPhone, and it’s own pane in the redesigned Activity app on the Apple Watch. You can enter anyone’s iCloud email or phone number to send them an invite to be Activity buddies (my words, not theirs). Once you’re buddied up, you can see each other’s health data in real time. As I write this piece, it’s 9:22AM on a Saturday and I am at 8% of my daily move goal and one of my friends is at 6% of theirs. Not only can I see what percentage they are towards their goal, but I can see what their goal is, how many active minutes they’ve had, and how many hours they’ve stood today. It’s more information than you’d want to give to just anyone, but it’s a nice amount of detail to see about people you are close with. In addition to real time data, you also get to see the past 7 day’s worth of activity data, again complete with full metrics, and basically everything you would see by looking at your own activity stats on your phone/watch. If you’re really serious about competing, you can turn on notifications so you get 1–2 notifications a day about where your friends are towards their goals. I can’t figure out exactly what triggers an alert, but it seems to be when a friend achieves a goal before you, or they just did a workout and their stats just shot up for the day. While it’s a little unclear what triggers these alerts, I found them to be a nice touch that pushed me just a little bit more to get out there and move a little bit. As one final note, watchOS 3 gives your some pre-canned responses you can send to someone when you get one of these notifications like “way to go!” or “it’s on!” if you have a competitive streak. These are a little silly and I haven’t found myself using them, but if you’re into that sort of thing, go crazy. Rest assured, all of this is opt-in, so you don’t have to share anything if you don’t want. And once you start sharing, there are controls you can set on a per-friend basis to either mute their notifications, hide your activity from them, or just remove them as a friend altogether. While Apple made a bunch of good moves, there are things I still want to see them add in the future. I’d like to see Apple expand the functionality of these rings just a bit, though. As it stands now, the only ring that can be adjusted for your needs is the red ring (calories burned). You can set a daily goal and then at the start of the new week, your Watch will give you a new suggested goal based on how you did the week before. If your goal was 400 calories last week and you beat it everyday, it might suggest 450 for the next week. If you didn’t make it every time, maybe it will take it easier on your and suggest 360 calories. This ability to set personal goals and make progress over time does not extend to the green or blue rings though. You are always expected to get 30 minutes of activity and stand for 12 hours. I can understand the stand goal being static, but I would like to have a dynamic activity goal as well. Also, please give me media playback controls in the app. People tend to work out with music or podcasts playing in their headphones, and they’re almost certainly going to want to skip forward or pause at some point. Finally, the badges you can earn have not changed at all since watchOS 2. I like earning these, but there are not as “sticky” as I think they should be. There should be seasonal badges and daily badges that push you a little harder to work out. All of the badges you can get today are evergreen, so if you miss it today, you can just get it later. Give me one on New Year’s Day a badge called “New Year, New You” that asks me to complete a 30+ minute workout. If I don’t do it on January 1, I can’t earn it tomorrow because it’s gone. “Weekend Warrior,” “Turkey Trot,” and “Holiday Weekend Boot Camp” could be timely badges that you get one shot at earning. I would be all over these badges and they would absolutely give me more motivation get out there and move. I’d also be more likely to share those badges on social media. Unlike the other things mentioned in this review, the Breathe app is not something I am using regularly, but it’s too damn banana-pants crazy not to at least bring up. The joke is that “the Apple Watch reminds you to breath” which is clearly the stupidest thing ever…but is it? It’s actually a very nice little addition to the Watch for a certain group of people. Yes, of course we all breathe all day and don’t need our watches to remind us to do this autonomic human function, but some of us need it to remember to stop everything and take a second and focus on one thing, our breath. Even writing that sentence, I know it sounds silly and hippy-dippy, and it’s definitely not something everyone is going to get value from. But speaking as someone who actively tried meditation for the first time last year, I can attest to there definitely being some value there. The Breathe app in watchOS 3 is really just that, an app that helps you meditate. This is a meditation focused on breathing and no extra frills. You can choose how long each session should be (1–5 minutes) and how fast you want to breathe (4–10 breaths per minute). The app is always there for you to use whenever you want, but you can also set the app up to notify you at certain intervals for when you would like to get notifications reminding you to breathe. The app is fine, and it used the haptic feedback of the Apple Watch to tell you when to breathe in and out, and it’s a clever use of this sort of feedback. But like I said, this is a feature I simply have not kept using past the first couple days. The biggest thing I wish it had was a way to notify me at specific times throughout the day to take a second and meditate. Maybe something at 7:30am, 12:30pm, and 10pm would be nice since those are times for me that would work well. Setting alerts for every 5 hours is not really useful if that’s going to notify me while I’m on a conference call and can’t really stop everything for 5 minutes while I meditate real quick. I have been using watchOS 3 on my Apple Watch since June, and it honestly was a little hard to write this review (mostly written in late August/early September). I’ve been living with all these features for 3 months, and they all feel natural to me at this point. Apps that take forever to load are a thing of the past! Sharing my activity data with friends is just a part of my day-to-day at this point. All of these additions and improvements to watchOS feel like they’ve always been here, even though they are still so new. If you didn’t “get” smart watches before today and don’t see the appeal, watchOS 3 isn’t going to change your mind. It’s mostly the same features you know from the Apple Watch, but refined. However, if you like the idea of a smart watch but think that Apple didn’t nail the execution the first couple times around, then this might be the update that wins you over. Like I said in the intro, this is an update that feels almost as much like a hardware upgrade as it is a software update. Everything is faster, and the software is more capable. I certainly have complaints with how far Apple went with some features and wish they had moved forward a little more, but I don’t think there are any places in this software update that I feel Apple has taken a step back. This isn’t just a minor update that you can wait on upgrading to, it’s an update you want to rip your watch off for, run to your charger, and patiently wait for this to be installed on your watch. You are about to start loving your Apple Watch a whole lot more.